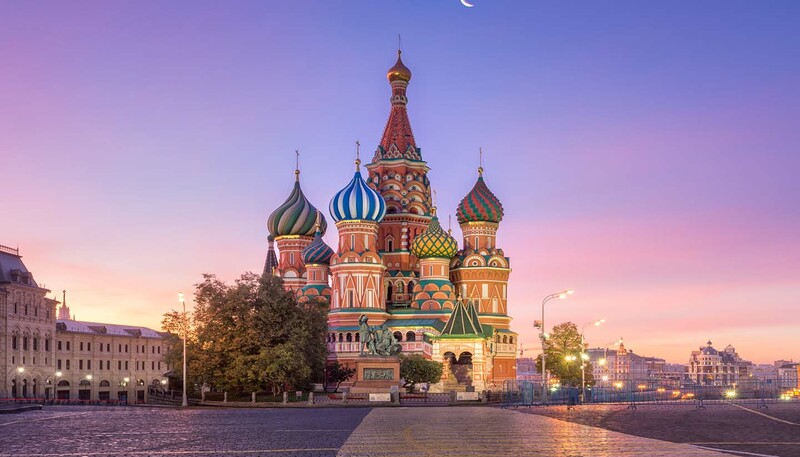 Russia has been through staggering upheaval with consistently profound consequences – this is one place where history does not pass by quietly. Populated by Slavic tribes, by the mid-ninth century the first East Slavic state of Kievan Rus’ had emerged, stretching from Kiev in the south to Novgorod in the north, before it fell to the Mongol invasion during 13th century. In the 16th century under the rule of Ivan IV (the Terrible), Russia became a unified state and began the conquest of Siberia. Three centuries of Romanov rule commenced in 1613 when Michael Romanov was elected as tsar. Peter the Great has emerged as the most well known of this dynasty, transferring the country’s capital from Moscow to the newly built St Petersburg in 1703 as he looked to the countries of the west for inspiration to create a country that was their equal. From 1815, following the Napoleonic Wars, Russia saw a series of autocratic leaders and growing revolutionary tension, which came to a head during the reign of Nicholas II, the final Emperor. The October Revolution and death of the tsar and his family in 1917 lead to the formation of the Soviet Union, the world’s first Communist state. The death of the revolutionary leader Lenin saw Joseph Stalin emerge as the dominant force in the Communist Party and the start of Russia’s most brutal period in which collectivisation and rapid industrialisation were punctuated by purges and show trials. During the years prior to WWII Stalin dragged the Soviet Union to a position of superpower on the world stage, but at enormous human cost. The post war years ushered in the Cold War – a tense standoff between the Soviet Union and the West, which only came to a close with the break up of the Soviet Union in 1991. After the chaos of Yeltsin’s presidency in the 1990s, Vladimir Putin has maintained a firm grip over the Kremlin since winning the 2000 presidential election. When Dmitry Medvedev was elected President in 2008 Putin became Prime Minister, but returned to the presidency in 2012. For all his efforts to present a modern Russia to the world Putin seems increasingly content to plough his own furrow – deploying troops to Ukraine in 2014 and encouraging the accession of Crimea. Russia’s intervention in the Syrian Civil War in support of the Assad regime against Islamic State continues to divide opinion. • Russia’s Soyuz rockets are the only means of transport for astronauts to the International Space Station. • In 2002, Russian Ark became the first feature-length film to be shot in a single take. • Russia’s national tree is the birch. Mainly Christian with the Russian Orthodox Church being the largest Christian denomination. Muslim, Buddhist and Jewish minorities also exist. It is customary to shake hands when greeting someone, though never across a threshold. Company or business gifts are well received; if you’re invited to someone’s home do bring a token gift, but avoid clearing your plate when eating; leaving some food is considered as a good sign. Conservative wear is suitable for most places – women will need to cover shoulders and wear long skirts to enter an orthodox church – and the seasonal weather should always be borne in mind. Smoking and drinking is widely acceptable, but the former has been prohibited in restaurants and cafes since 2014. Russian society is still highly patriarchal and hierarchical; this may be reflected in chivalrous acts (men holding doors open for women for example) but it may also mean that women are taken less seriously, and engaging in ‘unfeminine’ behaviour may be interpreted wrongly, although being a visitor may get you some leeway. Be careful with gestures – in Russia, giving the ‘thumbs up’ sign is an insult not an ‘OK’. It is prohibited to take photographs of any military installation and/or establishments or sites of strategic importance. Failure to abide by this could result in police arrest. Russian is the official language, although there are over 100 other languages. English is widely spoken by younger people as well as some educated older people. Do you speak English? = Gavaritye pa anglisski? How are you? = Kak vi pazhivayetye? How much does it cost? = Skolka stoyit? Where is …? = Gdye …?